Our civilization undertook its march a long time ago, but, where are we going? The picture is not pretty. Unless we just choose to ignore it. Unfortunately it’s now everywhere around us and even in our own intimate lives. It screams in the face of even the shallowest, socially impaired and, a new factor, the most financially at ease among us. It is not only the broken-down state of the environment, the increasing general poverty, or the über flimsy economic state. It is also the sad image of human health in general and at all levels: physical, emotional, mental and social. Facts in hand: Obesity with all its health consequences is now epidemic across the globe and can be witnessed in younger individuals -as early as 4 years old-. Major depressive disorder is now the leading cause of disability in established market economies worldwide and hits without warning sooner, as early as 14 years old. Victims of cancer, who feel they received a death sentence, are growing in numbers, despite all the years of research and billions of dollars we the people globally invested[i] for a cure. And this is only the tip of the iceberg. This one, unfortunately, is not melting away, quite the contrary. Understanding how the brain has evolved and how different aspects of it were enhanced throughout the ages, driving thus way society and personal choices, can help us figure out where we come from, where we are heading as well as where we should be heading. It could help us become conscious of the conditions to fulfill in order to reach the intended destination. This is so essential that Europe and USA have put aside special funds for brain research[ii]. Nature has a plan for us – we are a part of her-: the full expression of its model[iii] which I labelled the LIFE biosystem[iv]. Why would nature create and allow survival of an animal which might destroy it? The purpose is in the system. It speaks to us of the journey we humans embarked upon, a long time ago, once upon a time. It shows the forces working within human groups depending on the ideals promoted in their midst. It can tell us about the Promised Land we are meant to reach, unless we do nothing and accept auto destruction before realizing our mandate and reaching nature’s goal. What does this system, in a nutshell, tells us about this civilization? 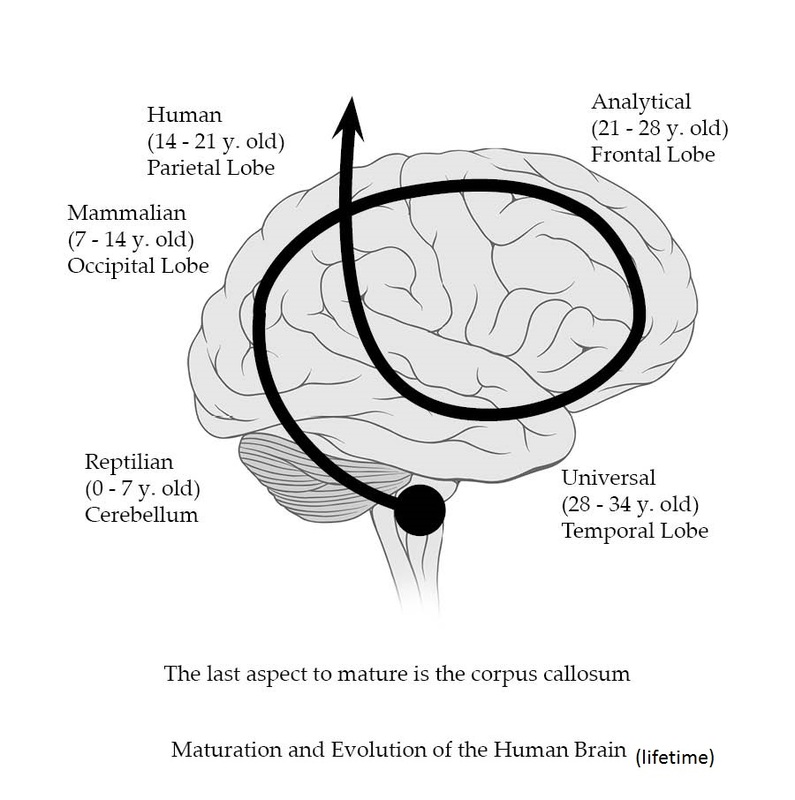 The model is divided in 5 phases or stages which can be found in the maturation of the human brain as well as in the cycles of nature. Let’s see those of the brain and how they influenced humans. With the Reptilian brain control, obsessed with food availability and territory, humans have felt the necessity of controlling space and environment and devised clever ways to permanently secure for themselves territorial ownership. This led to the many wars of the past, of the present and alas, of the future. With the Mammalian brain supremacy, larger groups formed since to impose hegemony, numbers count. They created rules and laws to protect their own against strangers. A more powerful group could control a larger territory and had access to more goods; the more violent or deceptive group could dominate all the others. With the Human brain authority, ideology created alliances within those groups and between groups which became even more powerful as self-sacrifice was idealized. The group with the strongest ideology- the one bringing the most unity within it- won over the others as even the invisible, God, was with them. Identity showed itself to be a remarkable tool of cohesion as well as of division. Religions, kingship and different types of government evolved from this phase, replacing tribes and clans. This stage is controlled through fear and physical realities. But the system shows that its positive qualities require a certain maturation and consciousness of the human mind in order to be maintained. This is possible only when we have sailed through the Rational (analytical) and Universal phase as a group because discernment and empathy are prerequisites brought by the proper maturation and expression of the Analytical and Universal brain aspects. The following phase of the Analytical brain, allowed the rise of mercantilism and businesses while the kings and queens were decapitated of their powers and significance. Kings, religions and governments had won over groups with no leaders or inferior ideals, but lost in the hands of businesses. Because the ideal was no more the promotion of a common health and wealth but became egocentric, we witnessed the rise of consortium and agro-chemical-businesses as well as business despotism which now rule over the leaders of most countries. Since this stage is normally controlled by the laws established in the Mammalian phase, actors here tried by any means to circumvent and manipulate these laws. And they succeeded. Businesses now freely sue governments aka `the people’ in a type of auto-immune disease. This is the phase our civilization is in now, although the majority of the population was stopped in its march of evolution and often are reduced to a general maturity level seen in the Mammalian phase. This, to the pleasure and great interest of financial powers. It is the result of a general absence of identity (outing of religions and kings and establishment of financial globalization) and a consequential out of control consumerism, expression of an uncontrolled masculine polarity. Polarity here does not refer to gender but to tools we all use: perception (feminine polarity) and response (masculine polarity). The feminine polarity is essential to a healthy masculine one and to evolution. Healthy, the masculine polarity protects the feminine one. Unhealthy, it simply destroys or ignores it. 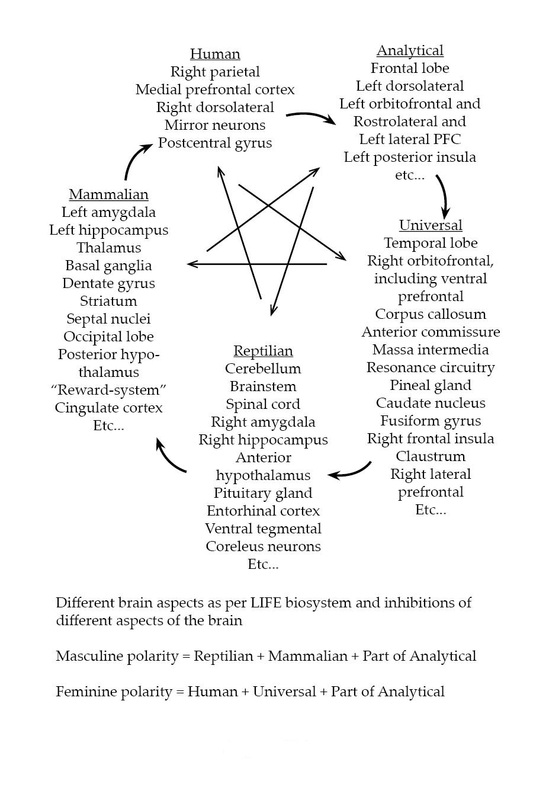 In the brain, the masculine polarity comprises the Reptilian, Mammalian and part of the Analytical brain aspects mainly in the left hemisphere. The feminine comprises the Human and Environmental (social) aspects linked to structures mostly situated in the right hemisphere. It is up to us to choose which of the Reptilian, Mammalian, Human, Analytical or Universal will rule because in any case, one will lead. no more regulation on it due to the deficiency of the general Idealistic self (Human brain), the general system will and is spinning out of control. This can be observed through many symptomatic events I enumerated at the beginning of this article but notably through the high level of mental and physical illnesses experienced by individuals throughout the world. In India alone the level of depression reaches 36% of the population. We can witness this social phase of the Universal brain active as groups try to be heard as well as by the rise of environmental consciousness. This phase supersedes the previous ones. Here, luckily for us as a group, ogre type businesses will eventually fail. Indeed, the environment, through natural catastrophes, general destruction of it and human physical and mental illnesses will win. How could a company survive when there is not enough people to work because so many are regularly incapacitated, if natural catastrophes render work, communication and distribution impossible, if stealing is rampant, if no one can afford to buy the goods you offer and employees are only interested in their paycheck? It can’t. Businesses will be ruined. Since the Idealistic Self is the only one which can control this phase, our only hope is for a new ideology, a new way of life shared by a vast number. An ideology which echoes in everyone because it is the expression of the implicate order, of the model on which nature (thus us) is built. In other words, our only hope for survival is through the awakening and strengthening of our general feminine polarity, through the understanding of what I named the Isis Code. This code, in fact the LIFE biosystem, expresses itself through all the elements of creation; it is manifested through all the flowers, all these invisible stars above us, all the people with their dreams and hopes. I am an expression of it, and so are you. 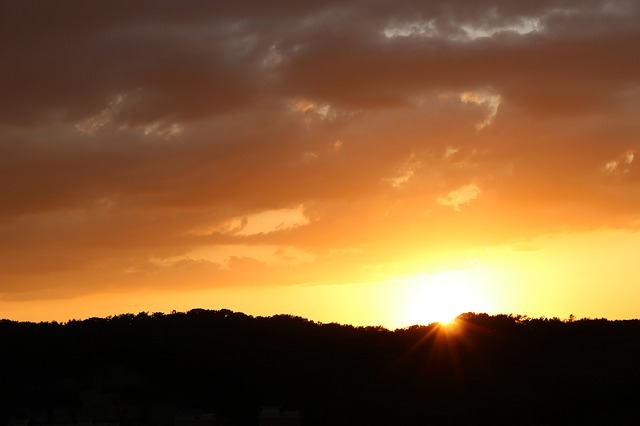 In our anonymous daily lives we can all strengthen and heal the general feminine polarity by protecting nature and childhood, by expressing love and beauty, and by creating sacredness. Also, to dissolve the fast spreading greyness cloak we can feel covers more and more this world, we really need a new breed of Women and Men to sit around the round table of the world, together, in harmony, as One. We need them to light up and protect the road that leads all humans to the Promised, Sacred Land.